Allen, Richard S. 1988. Revolution in the Sky: The Lockheeds of Aviation's Golden Age. Orion Books, NY. 253 pp. I'm looking for information and photographs of this airplane to include on this page. If you have some you'd like to share, please click this FORM to contact me. This airplane landed twice at Parks Airport. It was a famous airplane, because it was used by Amelia Earhart to set a few flight records. 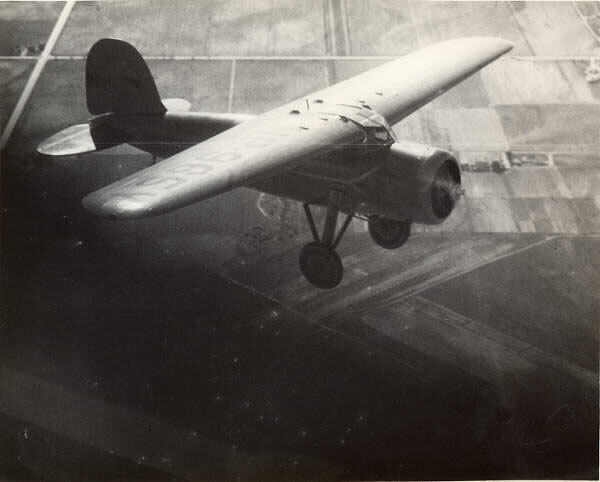 Below, from the Purdue University e-Archives (PUEA), is a photograph of the airplane aloft in 1935. NX965Y visited East St. Louis the first time on Thursday, April 23, 1931. It was flown by Lockheed factory pilot Marshall Headle. Based at Burbank, CA, Headle identified his destination as back to Burbank. The second visit by NX965Y was a couple of months later on Monday, June 22, 1931 at 5:00PM. This time the pilot was identified only as "Marshall." The handwriting differs from Marshall Headle's, so it's pretty clear that "Marshall" was a different person. Marshall identified his home base as "San Franzisko;" his destination as New York, NY. According to the Allen reference, left sidebar, NX965Y left the Burbank factory as a high-speed, Special 5C model in April, 1931 as S/N 171. "High-speed" meant it had wire-braced landing gear instead of strut-braced. It was powered by a Pratt & Whitney Wasp engine, S/N 2849. It was built on-order for John Henry Mears of New York City, NY. It was painted red and silver and was named "City of New York." Mears did not take delivery. Rather, 965Y was sold to Elinor Smith for a projected trans-Atlantic flight, which was not made. After two more transfers, it was purchased by Amelia Earhart who used it to set several records. She flew it from Hawaii to Oakland, CA in January, 1935, Los Angeles, CA to Mexico City in April, 1935, and Mexico City to Newark, NJ in May, 1935. A short article in Popular Aviation (PA) magazine, June, 1935, right, suggests that Register pilot Paul Mantz purchased NX965Y. There is no record of Mantz owning the airplane in the Allen reference. There is an interesting relationship between this airplane, Amelia Earhart and Davis-Monthan Airfield passenger William P. Lear. Lear provided the radio compass for Earhart to use on her Los Angeles to Mexico City and Mexico City to Newark flights. 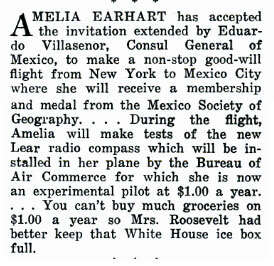 At left, from Popular Aviation (PA), September, 1935, is an article that put in place one of the preparations for Earhart's trip to Mexico, and invitation by the Mexican Consul General. Please direct your browser to Lear's page for further details, and for photographs of Lear's innovative radio compass. Below, from the Arizona Historical Society Library and Archives (AHS), is a photograph of Earhart's 965Y showing the placement of the loop antenna for the radio compass aft of the wing. The AHS identifies the date of the photograph as 1933. It is probably 1935, because the antenna wasn't installed until April that year. In 1936 the airplane was sold to Seth S. Terry of Reno, NV, who owned it until 1939. 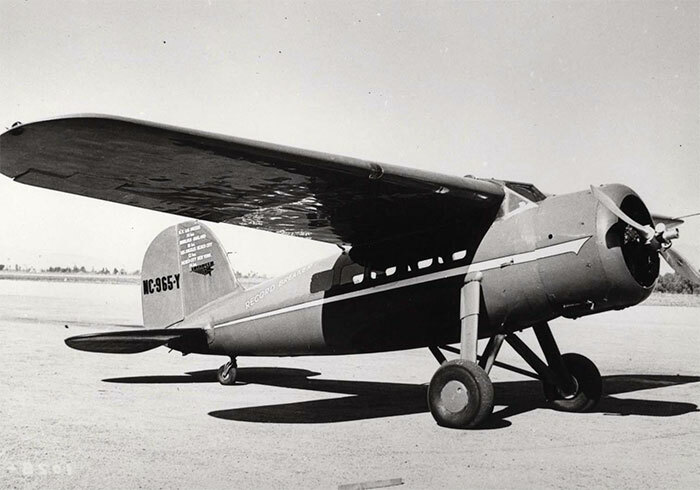 In 1939 it sold to Glover Ruckstell who flew it until 1942. He used it for charter and sightseeing and named it "Record Breaker." At some point between Earhart's and Ruckstell's ownership the registration was changed to NC965Y. 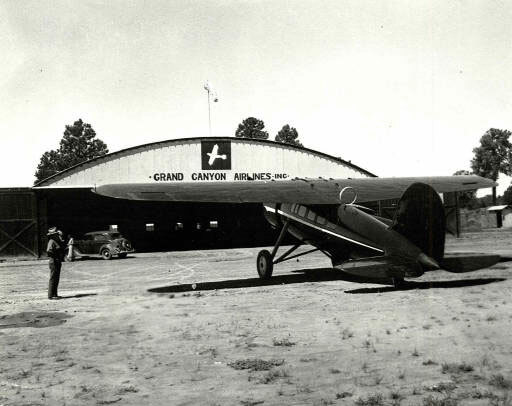 Ruckstell was associated with Grand Canyon Airlines. Below is a photograph of "Record Breaker" from the Hawaii Aviation Archive of Historic Photos and Facts (HAA). The date is probably sometime between 1939 and 1943. Look closely at the fuselage behind the wing and you'll be able to read "Record Breaker." Ruckstell sold NC965Y to broker Charles Babb, who sold it to Frank M. Matthews of Bethlehem, PA in 1943. NC965Y was destroyed on the ground by fire at Memphis, TN on August 26, 1943.